At S&S Roofing we know how amazing the perfect rooftop can be, of course, we look at a roof much more carefully than most. As far as we are concerned the perfect roof is architecturally perfect, installed properly, and last but not least, impervious to leaks. This is what we strive for on every commercial roofing job be do. Many times we cannot fix the architecture but with our extensive experience, we can make a substandard roof, incredibly effective. 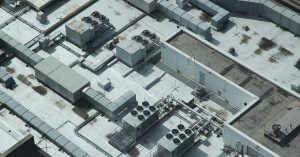 Many commercial roofs are flat and do not expel water as well as they should, the trade off is that the rooftop space is usable for all sorts of infrastructure like climate control and HVAC, electrical boxes, storage and even helicopter pads. 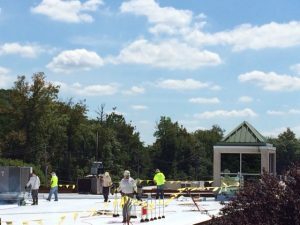 Many commercial businesses are thinking outside of the box when it comes to their roof and utilizing the space is becoming much more popular. Many commercial buildings are repurposing their roof spaces for many other uses. Particularly interesting is their use as a restaurant or a bar. Of course, the use of a rooftop as a bar is something that you can find in every major city throughout the country. In cities like New York City and Miami there are an incredible number of bars and restaurants located on rooftops. In large cities, the rooftop bar makes sense—it is a unique feature that draws people to the space. It is something special to share a drink with friends from a rooftop while the sun goes down. Many commercial building owners have thought about how to utilize their rooftops to maybe make some more income and restaurants are an ideal way to utilize the space while making money. People like the industrial feel of a commercial building and restaurants that are located in traditionally utilitarian buildings are extremely popular. The drive-in is a part of American culture that has all but disappeared. Creative building owners around the world have been experimenting with open-air rooftop theaters. There is nothing like watching a good movie in the open air and enjoying the atmosphere. Creating an outdoor, rooftop theatre is a great way to utilize your rooftop space in the evening for extra income. In Europe and Asia a large part of the culture, even the national identity, is soccer. This love of soccer is so deep that many play whenever they can, this includes short breaks at work. Many companies that have large commercial buildings have repurposed the roofs with soccer fields. This give the employees a chance to unwind for a bit but keeps them in close proximity to the office. Soccer fields are not the only way to utilize an industrial roof for recreation, there are many unique possibilities. Running tracks are very popular in the cramped confines of Beijing and tennis courts are not unheard of as well. This is due to the fact that recreational spaces much more crowded due to a compact population. A growing number of industrial and commercial buildings are turning to solar power as a way to lower energy costs. Putting solar panels on the roof is an incredible way to utilize the space. The solar panels also provide your roof with a greater degree of protection, kind of like putting a cover over your roof. So you get energy benefits and your roof will last much longer. In order to utilize your roof for anything other than deflecting the weather, it is critical that an assessment is conducted. 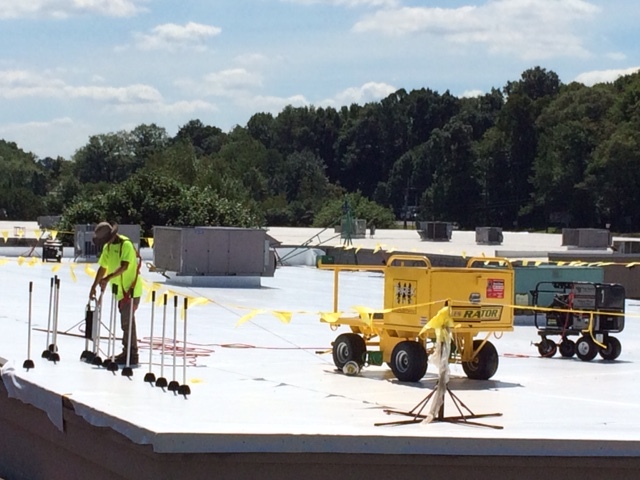 Many flat roofs have a maximum rating for loads and if it is exceeded, the results could be catastrophic. There are documented cases of buildings collapsing under the weight of too many people. 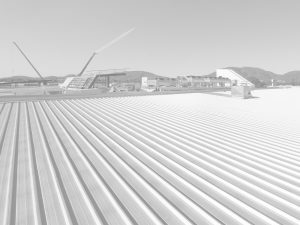 So as attractive as using your commercial flat roof might be for an alternative purpose, it may not be feasible without major reinforcement and engineering to the structure itself. The safest way to utilize your flat roof is to mount solar panels, it may not provide as much income but it will ensure that your roof remains structurally sound. Of course, before mounting solar panels, it is a necessity that your roof be replaced and resealed. 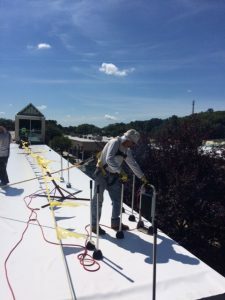 If you have plans for your commercial roof, contact the experts at S&S Roofing for a complete assessment and inspection. And if you are planning on building a soccer field on your roof, we can recommend a good landscaper.